Located in a shopping center facing the sparkling Long Island Sound, is Domenic’s Apizza West Haven CT. It is a carry-out establishment owned and operated by Domenic Giannotti. As you enter the place, you are greeted by the friendly, hard-working staff, or Domenic, himself (who is also friendly and hard-working). There are a handful of seats if your pie isn’t quite ready, and a cooler full of to-go beverages. It smells so good, you know you’ll being pushing the envelope of the speed limit driving home. When he’s not busy chopping onions, wearing his protective goggles and be-bopping around to the Top 40 tunes, Domenic is serving up some delicious thin crust apizza pies. 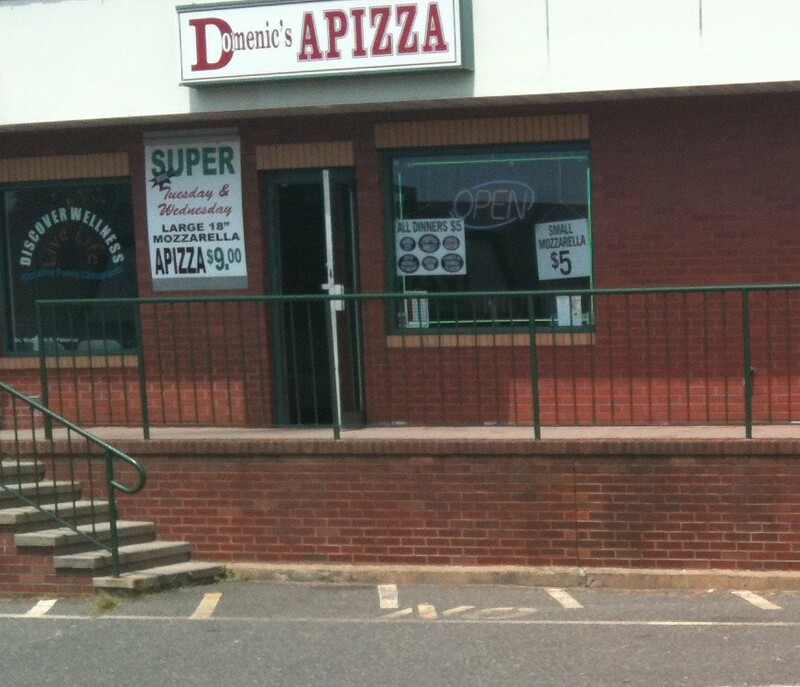 Domenic’s Apizza is delicious. It’s my “benchmark” pizza to which all other pizzas are compared. A simple mozzarella pizza will force you to make sounds of delight as you dig in to the thin, crisp, perfectly balanced pie. Sauce: Just right. Not too runny, or sweet, or spicy… and not too much of it, the perfect amount. Toppings: Harmonious to the type of pizza you order. Not too much, or too little. Nothing overpowers the thin crust, it’s just right. Ingredients: Fresh, tasty, and plentiful. With such a magnificently thin crust, the ingredients are chopped, sliced, and diced to offer an abundant array of evenly distributed ingredients, with enough crust to hold on to, but not so much that it’s like an order of breadsticks in your belly. Breakfast Pizza, Mashed Potato Pizza, Lasagna Pizza, BBQ Buffalo Chicken Pizza. Also offers: Stuffed Breads, Calzones, Sub Sandwiches, and select Italian Enrees. The mashed potato with bacon is one of my favorites. I’ve also had a white pie, with spinach and bacon. Sausage and peppers, mozzarella, mushroom and onion. It’s all delicious. I’m holding out for a special occasion, but I’m going to try their Breakfast Pizza. If what I’ve heard is true…It may take the place of my already non-traditional birthday cake (which is currently a pumpkin pie). Buy two, you won’t regret it.